This year, I teamed up with new friends that are serious dreamers + do-ers - the lovelies of Confetti & Co. - and got to make some gorgeous snail mail happen. We decided to send valentines with a great note inside that could pull double-duty as a daily reminder to the recipient. A little something positive that can bring some beauty to every day? Yes, please! I cut cream-colored heart shapes to be paired with heart-shaped confetti in pink, grey + silver tones. The back of each heart was signed with a "XO" from myself and Confetti & Co. Again, two variations were made, with placement of our names being the only change. lettering by Hello, Bird. 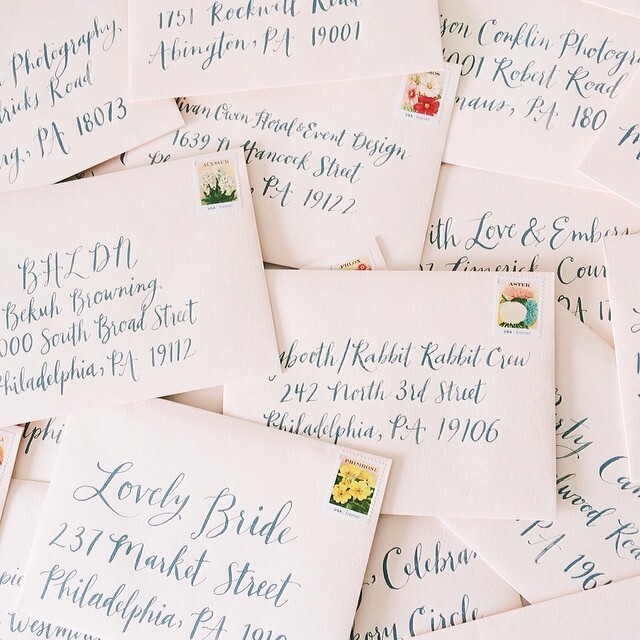 // photo by Sara Murray, Confetti & Co.
Blush envelopes were addressed in the same light grey ink. Sara and the Confetti & Company crew hand cut some crepe paper hearts and packed up the envelopes with valentines + heart-shaped confetti. They finished packaging the envelopes with some gold tape and vintage seed packet stamps. I had such a great time working on these, and can't think of a more perfect way to send love in the mail for Valentine's Day!